I've been tagged by Kathy. Best Friend? Jesus. I've known Him as Savior for 32 years! Reason to Smile? A new day w/ new mercies, and my family. Season? I have favorites in all of them. Right now, um... Fall. I'm ready for pumpkins, candy apples, cool mornings, falling leaves, fires in the fireplace, and pumpkin spice lattes from Starbucks. Unknown fact about me: I had a Dorthy Hamil (sp?) haircut in the 3rd grade. I went from very long hair to this style. I wanted to look more professional when I roller skated on my driveway. LOL! Vegeterian or Oppressor of Animals? I don't like how that is worded! We do eat meat but I am really enjoying produce from the garden. Xrays or Ultrasounds? I've had both. Your favourite Food? Mexican food...salsa, guacamole, queso, fajitas, yum! Zodiac? No! Do people really believe this stuff! The much anticipated and prayed for Siesta Fiesta was fantastic. It was such a joy to get to go with my Mom and Dad and Mr. Incredible. Here we are in the stands. We are on the second row between our Miestas. Do you see us? Travis and the praise team were fabulous. His new Christmas album comes out in October and I can hardly wait. He sang one of the new songs on Saturday and it blew me away! It's simply amazing. Wow! God has blessed him! I've so admired Big Mama and Boo Mama's blogs (Melanie and Sophie). They just bless me every time that I visit. They are absolutely hysterical, creative, and so down to earth that you would love to sit and have a cup of coffee or a big glass of sweet tea with them. They are amazing moms and they fiercely love Jesus and it shows in their writing. I knew that Lifeway was bringing them to the event and I secretly hoped for a chance to meet my blogging mentors. Saturday morning, we headed down to the lobby of our hotel and guess who was there????? Oh, my heavens! I was so excited. There they were standing by the door waiting for their car! Delight! I was star struck big time! I really didn't want to bother them, but I just couldn't contain myself. I introduced myself and then we took a picture. I think I told them that they were such a blessing to me but I can't remember. They are just the sweetest things and could easily be America's best friends.They are just like they appear on their blogs, incredible! Five minutes later Beth Moore, Amanda, Melissa, and her body guard walked right in front of us to their waiting car. I couldn't believe it! The Lifeway Gestapo man wouldn't let me take a picture of them as they passed by. (It's okay Rich. I understand, I really do and I really don't think of you as Gestapo Man) I think he thought that I wanted to pose w/ Beth. I think this is funny because if I could hardly speak to Melanie and Sophie there is no way that I could have asked Beth to pose with me. What a sweet surprise God blessed me with! He loves to give gifts to His children and I felt so loved! Here is a brief recap of Beth's message. We learned that we are heirs and that we have a beautiful inheritance. Psalm 16:5-6 says, "The Lord is my chosen portion and my cup; You hold my lot. The lines have fallen for my in pleasant places; indeed I have a beautiful inheritance. 3. He is my portion...and (amazingly) I am His portion. (Psalm 16:5, I peter 2:4-5, Psalm 73:25-26). 7. I can be secure. (Only Jesus can identify me or tell me who I am and that is true security) Our theology has not become our reality if we continue to walk in insecurity. 8. I have a beautiful inheritance. Isaiah 61:1-7, Ephesians 3:6. It's far better than we can imagine. Confidence in my inheritance changes how I look at myself and my past. It was a weekend to remember and treasure. I just loved going with my sweet husband and my wonderful parents. May each one of you have a blessed Labor Day weekend! What a week this has been! I'm so thankful that the girls are enjoying their classes, that Hannah hasn't had a bit of trouble with her locker, and that I managed to complete all of my homework assignments for the week. And then there have been a few other moments like my keeping it real post. I sat at my computer tonight to tell you all about Living Proof Live this weekend. I got to meet Big Mama and Boo Mama at the conference. I even have a picture to show you. But, instead God blessed me with a sweet word of encouragement and reassurance. Isn't that just like Him? Oh, He knows exactly how to get to this heart of mine. I so needed to hear this Word tonight! He said, " It is of the LORD's mercies that we are not consumed, because His compassions fail not. They are new every morning: great is Thy faithfulness." Lamentations 3:22-23. Yes Lord, one day at a time. It's not my strength but Yours. You have called me here and You will complete the work that you started in me. I will not be consumed because great is Your faithfulness!!! I'm so thankful for His great mercies. Lamentations 3:23 says they are new every morning. I've had moments this week where I have needed them every hour. Can you relate? You know what? He provided those new mercies. Instead of crying, He brought joy and laughter. (Okay, I'm crying a bit right now, but they are happy tears because I'm just so in awe of Him). When I brought Him failure, He provided a lesson that He is all sufficient. What a great God He is. I'll go anywhere He leads me! I'm thankful that He is alive and active in me. I'll take weeks like this over complacency and just plain boring any day because He is showing me more of Himself, His power, and His great love. What a privilege to be His child-that is much to be thankful for! Keeping It Real! Mother of the Year-ugh! day of school, people! I'm just a mess about the whole thing. I called Mr. Incredible between classes to get some support (meaning permission to check myself into the rubber room in the city down the road). He just laughed. Laughed! When he didn't hear my laughter, he quickly quipped, "It's okay baby, I'm sure she didn't starve." Ugh! So, in case you are one of the tens of people that think I have it together...there ya go! I was reminded of a scripture this morning, "I desire to do your will, O my God;" Psalm 40:8. Yes, Lord I desire to do Your will. This is why I am so desperately trying to finish school like He called me to do. But in the craziness of taking 5 English classes (3 senior level and 2 junior level) in the same semester I'm already a mess. He knows my heart's desire is to do His will and He will certainly help me accomplish what He is equipping me to do. I'm just asking the Holy Spirit to whisper a little louder next time when it comes to feeding my children LUNCH! I better get myself to class. Thanks for blessing me by stopping by. If you have it all together, I'd love to know how you do it and if you have a Mother of the Year story, I'd be so pleased to read it if you don't mind keeping it real! My baby is in Junior High, ya'll! My baby! I still can't believe it. I say this all of the time but I have to say it again: Where does the time go? It seems like only yesterday I was holding this precious one in my arms. Now her arms are nearly as long as mine! She is mighty proud that she is almost as tall as I am. She is 5' 81/2" tall. Oh, my! Please, meet the future Mrs. Nick Jonas! He is sure to put a smile on her face every day, between every class. She hearts Nick Jonas! Can you tell? Rachel and I had fun thinking about her first locker. She had pictures of our trip to St. John, US Virgin Islands. Her locker was very peaceful and serene. Both first lockers were special and fun to decorate. I'm so thankful that I got to be a part. My girls are such delight! I had such fun using some for home made salsa, freezing some for homemade pizza sauce and for chili in the winter, and giving away bags of tomatoes. I should have just as many to pick in a few more days. I'm so excited! My freezer is starting to look like it belongs to a real live gardener. What a blessing my garden has been! Well, I better start cracking open a few books. May you have a blessed day doing whatever God calls you to tackle this day! Living Proof Live - San Antonio from Rich Kalonick on Vimeo. What an incredible weekend we had! I can hardly wait to share with you details from the event. But, I better get my girls and myself to class. Alas, summer ends and another exciting journey begins. I'll try to post details soon! Today is the first day of school! I have dusted off my crock-pot in preparation. Rachel will be a sophomore, Hannah starts Junior High, and this is my senior year in college. Woo-hoo! I'm keeping it simple this week. Thank you for stopping by my blog! May you have a blessed week in the Lord. Place chicken in crock-pot. Mix together dressing, soup, and mushrooms. Stir into chicken. With slotted spoon, remove chicken and set aside. Combine juices w/ sour cream. Cover and warm through. When ready to serve, place chicken on bed of rice or noodles and pour sauce over the top. 1 envelope low sodium taco seasoning. Place chicken in crock-pot. Mix tomatoes & taco seasoning and pour over chicken. Cover and cook on low for 6-8 hours. Serve in tortillas w/ your favorite fixings. I am so excited! We are on our way to Living Proof Live's Siesta Fiesta. Have you heard about it? Beth Moore? It is going to be incredible! We have been praying for this event for nearly a year. I've had my tickets for several months now. I can hardly wait to see what God does this weekend. Travis Cottrell and his amazing praise team will be there. Women from all over will be there too. I've heard that Big Mama and Boo Mama will be there too. How cool! I'm just about to burst all over with excitement. Please, pray for us as we travel and for God to do a mighty work this weekend in the lives of so many. I can't wait to tell you all about it! Have a blessed weekend! Today, I'm thanking God for our summer...for the special memories...joy and laughter...lazy days...going to movies...trips...adventures in teaching Rachel how to drive...picking up Hannah from basketball camp...hearing about Rachel's first mission trip to Arlington...the decision to stay at our home church...new blogging friends...A+ in Industrial Psychology...back to school shopping...watching the Olympics together...gardening in our vegetable garden...water gun fights...shrimp boils...wii tournaments...guitar hero...sweet memories to last a lifetime! School supplies and new school clothes have been purchased, which means it's almost that time. Part of me is ready, part of me is not. Time for busy schedules and new adventures with the Lord. I'm thankful that this is my final Fall semester as an undergrad. It's my senior year in college-part of steps of faith in returning to what God called me to do years ago. Rachel begins her sophomore year and Hannah start junior high. Be still my heart! Oh, there is so much to be thankful for. Father, thank you for the blessing of summer and for special memories with my sweet daughters and husband. Thank you for this season of rest. May we bring you much honor and glory this school year! You alone know what this school year holds. We trust you all the way. You lead and we will follow. I'm so thankful to be called your child. Thank you for the privilege and joy of being a wife and mother. You are so good! I was in awe that God was blessing me with such a fun adventure! The training was fun. The flame retardant suit fit like a glove. I was feeling just great until they strapped the helmet on my head. I started to feel very claustrophobic, so they removed the helmet for me. I didn't think I was going to be able to do it. At that moment God told me to not let fear keep me from His blessing. So, I said out loud, "I can do all things through Christ who gives me strength." 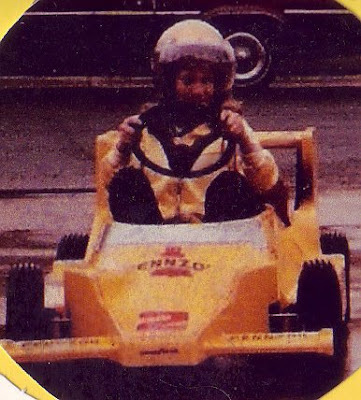 I asked the trainer to put the helmet back on and then I boldly climbed into the car. I wasn't scared. It was just me and God speeding through the race track at 149.81 mph. I talked to Him the whole way. I kept saying, "Delight! Delight!" 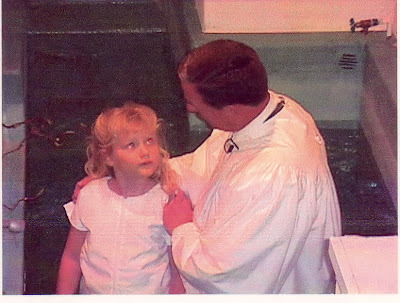 It was a journey with God that I will never forget. I'm so thankful that He encouraged me to trust Him and to enjoy my blessing. He is so awesome! I wouldn't have missed this adventure with Him for the world! I can say that about so many adventures with Him. I don't want to let fear keep me from doing what God calls me to do. For more Word Filled Wednesday blessings, click here. You will be blessed! We are tackling Scrapbooking around here. Every summer, I set out to scrap our year in photos. My goal is to have everything caught up and put in albums before another school year begins. I have had this on the back burner, so to speak, all summer. I took an online psychology class, taught Rachel how to drive (be still my heart), worked in my vegetable garden, tried to go through my house and clean every nook and cranny (is that really a word?) in preparation for school, learned how to blog (and oh, how I am loving this outlet and all of you that bless me by your visits and sweet comments), and just enjoyed time with my family. Well, school begins in less than a week. Today was rainy and foggy and the perfect day to set aside just to scrap book with my favorite scrappers in the whole world, my daughters. We turned dish network to the Contemporary Christian song channel, sang, scrapped, laughed, and just had fun being creative together. We finished 38 pages and we are just down to scrapbooking last summer's Disney Vacation. We saved the largest group of pictures for then. It's been a fun day! I just have to add, we never would have completed 38 pages without the help of my Cricut machine. My in-laws blessed me with this machine for Christmas and I just LOVE it! It sure makes cutting shapes, borders, letters, and page elements so much easier. We keep finding new ways to use it. What a wonderful gift it is!!! Here are a few examples of our work today. These are the pages spread out on my living room floor. (We surprised the girls w/ tickets to the Hannah Montana concert at Christmas. We couldn't just wrap this gift, oh no, we sent them on a fun scavenger hunt. We involved Reggie's sister, our nephews, and our parents. It was so much fun! I thought I would nearly burst! It is soooooo hard for me to keep a secret. So, we had to give this gift to them early. I just couldn't wait! I'll never forget the screams of delight. Fun memories! That's all for now. I better get some sleep. We tackle the Disney pictures in the morning! It's that time again? Only one more week before school begins here. Oh, my goodness! I hope you had a blessed weekend. We are having skunk burgers every night. Oh, I'm kidding! Friday night homemade pizza night a day early! I'm thinking pepperoni or hamburger. Living Proof Live Conference! Woo hoo! 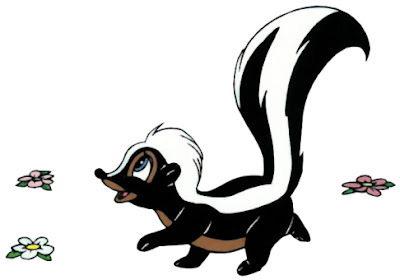 Well, we are recovering from Pepe-Le Pew (as someone commented on my blog). There are faint smells in the air but it is so much better! What a fun adventure that was! I don't care to smell that ever, ever, ever again! And just in case you ever wonder, having a skunk spray all manner of tarnation in your garage is the best diet. You don't care to eat anything! But, I wouldn't recommend it. The phone rang late that stinkin' afternoon. It was my oldest nephew. His sweet voice said, "Aunt Kiki, the next time you have a skunk in your garage, just call me." Okay, sweet nephew, you're on, but I hope I never have a skunk visit my garage again. It's a no skunk zone! All little stinkers stay away! Anyway, I can't believe it is Saturday already! Where does the time go? We just have 9 days before school begins and only 6 days until Living Proof Live in San Antonio. Hola Siestas! A beautiful frame that looks great in my kitchen. I had the blessing of being the winner in Nikki's drawing. Aren't they cute? I think they are just adorable and I am so thrilled to have them. A sweet friend of Rachel's shared his backstage passes and they both got to ride a bus to the stage and actually sit on the stage while Switchfoot rocked out to songs like, "We were meant to live for so much more..." She was so excited! I enjoy working in the yard. Really, I do. I look forward to mowing, diagonally is my favorite pattern. I just plug in my IPod and start mowing, weeding, and enjoying being with the Master Gardner and His beautiful creations. I am fiercely competitive. You may know this from my bowling fiasco. In the words of Nacho Libre, "I wanna win!" When I was in the fifth grade, I wanted to get my ears pierced. My Dad told me that I could get them pierced only after I scored 5 goals in my soccer season and after I read Ecclesiastes. I was the goalie and a full back. The odds were not that great. But, guess what? I did it and I have the holes in my ears to prove it. I have to add, it's not my fault that I am super competitive. I have super competitive parents, its in the genes, and I've proudly passed those genes on to my girls. Really, you can be super competitive and sweet at the same time. It's an art form. 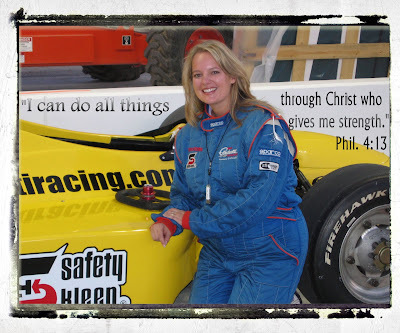 I drove an Indy car 149.81 mph and I got to drive 12 laps. So fun! I heart speed! I can't seem to get enough of the Olympics this week! Our family leapt off the couch when Michael Phelps and the guys won the first relay. There is so much patriotism and camaraderie. This is the best reality TV ever! Oh yeah, and I dislike skunks! 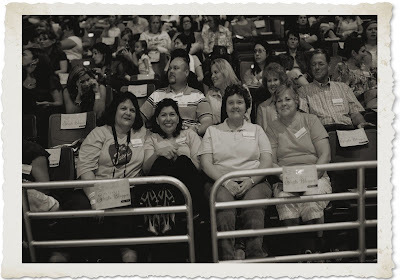 So, now I'm going to tag: Kim, Erica (I just saw your 100th post-it was fabulous and I'm letting you off the hook :-) ), Melanie, Denise, Elizabeth, and you! Name 6 random things about you. There's a Whole Lotta Stink Going On! In an effort to be an organizing kind of girl, and with school just around the corner, I felt the need to clean up the garage and reorganize a bit so my "learning-to-drive daughter" could park a little more easily in our garage and not take out my Suburban or pink golf cart in the process. (You are doing great baby, keep up the good work). "Momma! Is that a black and white brush or tail under the freezer?" Oh my goodness! Jump back! It's a skunk and he's under the freezer, in my garage! "Dear, we have a bit of a problem. The skunk we saw last night in my garden (you know the one that got away before you could shoot it?-please don't judge me for that we live in the Wild Kingdom where Fox, Coyotes, rattlesnakes, and apparently skunks roam.). I don't believe I said it that calmly. (yes I have my own, it belonged to my Pappaw-it's a 22 I think. I used it to kill a coyote that had killed one of our puppies right in front of me a few years ago-I had a Little House on the Prairie moment then too. My man was at the deer lease, oiy!) Today he was at work. What is up with that? I said, "Get out my gun? I might ricochet and kill myself!" I wanted prince charming to race home to my rescue, but he's having an important business meeting with some man that thinks he's more important than the skunk. Can you believe that? Anyway, Mr. Incredible redeemed himself by calling in the skunk cavalry. They rode in on a beautiful white ford pick up truck. Their response, "Wow! That's a big one. It's going to smell." What's a girl to say? Kill him! Blow him to pieces! Get him out of my garage. I have children to take care of and my garage already smells like Skunk #5 (instead of Channel #5--ha!). I'm off to take a bath in tomato juice, if I can't get this stink off. Funny, I just wanted to beautify my garage. Now, I'm going to have to deodorize it all: the house, the cars, the garage, myself. Ode to joy! I still have my sense of humor. I'm giggling to myself because I was just telling the Lord that while my posts this week have been very spiritual, and all about Him, I like to provide a little humor every now and then. He just smiled and then provided some new material just for you! You're welcome! Off to the garage I go. Our house is the one with the green fumes and the crazy lady with all matter of cleaning products! So, being the rule follower that I am, I wrote in my best 3rd grade penmanship, "Write the seven continents." I checked to make sure that I wrote "every word," and turned my paper over. I was the first one finished and I thought to myself, whew, that was so easy! The next day I received my test back, expecting an A, I saw in horror a big, fat, red F on my paper! I could hardly stand it. I was a straight A student. I had never received a grade even close to this one. I had to fight to hold back the tears all day long. I can remember giving my test to my parents and then the tears began to flow. My teacher thought I was being a smart-alec. She didn't know, I was just trying to do what she had asked me to do. I think my friends laughed at me that day too and that hurt. I was having a Norbert kind of day! (Norbert is the main character in a fabulous children's book by John Trent called, I'd Choose You). I remember my mom listened to me cry that day and she tried to encourage my heart. She told me not to worry and that it would all be okay. My parents took care of that incident for me. Go Mom & Dad! I'm thankful for parents that will fight for their children when we need it. She was right, it did all turn out okay. She showed me that I can still be thankful even when I'm having a Norbert kind of day. She taught me how to write down my blessings. It's amazing how your attitude changes when you start writing down what you are thankful for. As an adult, I still have Norbert kind of days. This world tries to steal my joy and to be honest sometimes I just let it get to me. God tenderly reminds me of a special lesson from childhood and I get out a pencil and paper and list my blessings. I can never finish a page before I'm sporting a new 'tude (attitude) and the joy and thankfulness returns. After all, aren't we suppose to be joyful always? (I Thessalonians 5:16) Take it from me, it's much easier to be joyful when you have a thankful heart of praise as an offering to Him. How long has it been since you wrote your blessings down? How long has it been since I wrote my blessings down? than to hear that my children are walking in Truth." What a heritage of faith is ours. R and I were both blessed with Godly, Christian parents and grandparents. They raised us in church, just as we are raising our girls. They taught us to study and know Scripture and to have a deep relationship with God and to try to be like Jesus every day! They taught us how to pray. Oh, I have fond childhood memories of kneeling by my bed at night and praying with my parents and praying with my grandparents when I would spend the night. My girls have these memories too! They taught me that it wasn't enough for me to just go to church. I needed a Savior! It has been 32 years since I received Him as my Savior and Lord. R was saved 31 years ago. 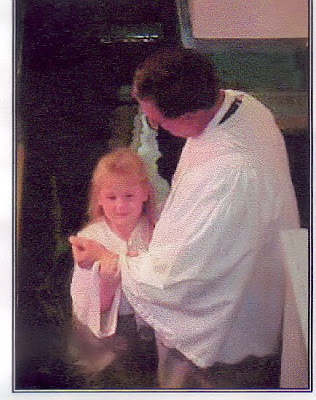 My Dad baptized them both. Oh, days to treasure and remember and to thank God! My eyes are filling up with tears of joy. Our circle is complete and that is much to be thankful for! If you still have family members who are not saved, don't give up. Keep praying and believing. I am praying and greatly looking forward to the day when I hear my little nephews call me and say, "Aunt Kiki, I asked Jesus to come into my heart and be my Savior today!" Glory! I can hardly wait for that day! Please visit here for more inspiring Word Filled Wednesdays. I am so excited to share this with you! It has been life changing as far as my prayer life goes. Have you ever told someone that you would pray for them (concerning a long term prayer request) only to get too busy and simply forget? I have and I just hate it when that happens. Oh, I prayed for them, right after they asked me to pray, but then I have trouble following through sometimes and hanging in there for the duration. There are so many promises that I want to pray over my children, our country, our church, our friends...but life gets in the way and it seems like I fall into my prayer rut of just praying for the same things over and over. Can you relate? Four years ago, I followed Lisa Welchel's advice and made my own Prayer Binder following her specific instructions. (You can find the instructions for the Prayer Journal by clicking on this address and scrolling down until you find June 21, 2004.) She also sells them. They are very good instructions. The prayer binder was easy to create. I just used a 3 ring binder, 2 packages of Avery business card, and 15 clear business card pages. I made ten categories that I want to be sure to pray for every day. They are: Rachel & Hannah (my daughters), R (my husband), myself, Family, Thanksgiving, Praise, Ministry, Personal Influences, America, and Friends. I made a different card for each category for 30 days of the month. If a month has 31 days, I just repeat one of my days. This way, I will have prayed 30 different promises over my girls and my husband, remembered to pray for everyone in our family at least once during the month (of course I pray for several every day :-) ) etc. By the end of the month I will have prayed for 300 of the most important people and issues that are on my heart! For the girls, my husband, and myself I listed specific verses for each day. An example would be: Excellence: "Whatever your hand finds to do, do it with all your might." Ecclesiastes 9:10. I have enjoyed using this prayer binder for the last 4 years. After 4 years, you can imagine that I would need to update it a bit. We have added family members, some have gone on to glory, ministries have changed, and even changes in friendships and personal influences. This was my tackle today. I'm so thankful that it is up to date now and I am ready to put it into use. I was showing the finished product to Rachel, my oldest daughter, when God prompted me to ask her if she would like to have one too. She was excited about praying in a new way, so we spent the afternoon making a prayer binder just for her. This was so much fun. She chose 6 categories to pray for each day. They include: She and her sister, Family, Thanksgiving, Praise, Personal Influence, and Friends. She designed her cover and I had fun adding specific scriptures for Rachel to pray for herself and for her sister. Here is a picture of her Prayer Journal. I can hardly wait to see how God uses this! James 5:16 says, "The effective prayer of a righteous man accomplishes much." Oh, its not our power that changes things, but God's power. My heart wants to make so many petitions for my family, myself, and our corner of the world and this binder helps me stay on track and lose the whole guilt thing! This Busy Mom's Prayer Binder has been a great blessing to me and I hope it will bless your life too! To God be the glory! Hide them in your heart...for children! Sharing the Love & Gratitude Awards! It's a Diaper Cake, Baby!